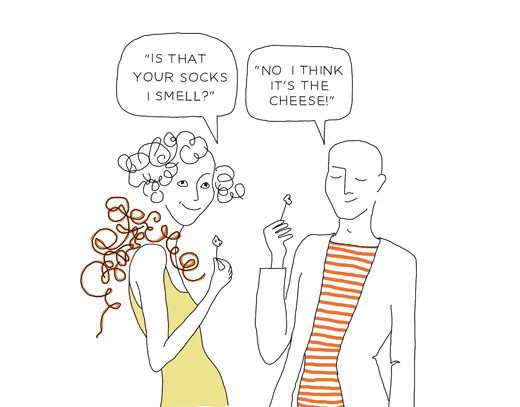 As many of you know, last year Tenaya Darlington (Madame Fromage) and I worked on a series of seasonal cheese articles. 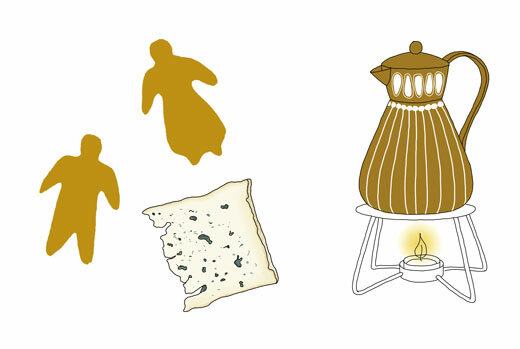 We were both dreaming of turning these cheeses into some kind of illustrated products. 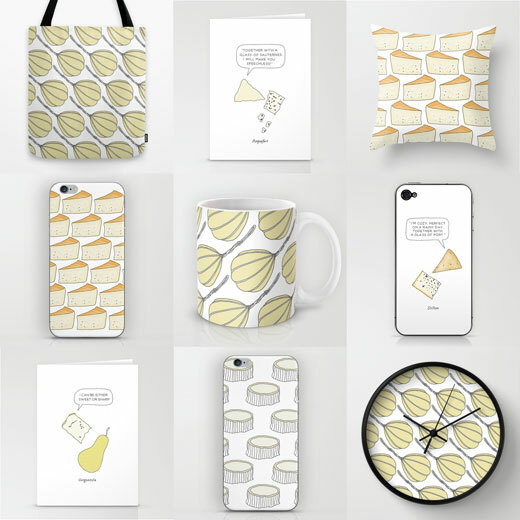 And today we are finally opening the doors to our cheese collection over at Society6*. I’m totally over the top excited about doing this with Tenaya and the best thing is, I’m learning so much about cheese. And don’t you agree that for any cheese loving person, these products makes great holiday gifts? Our cheese selection includes art prints, greeting cards, iPhone cases, laptop sleeves, tote bags, pillows, mugs, wall clocks, hoodies and T-shirts etc. One of my favorites is this pillow with a Provelone pattern. It’s decorative and hilarious at the same time! In the future we hope to add duvet covers and shower curtains to our cheese collection. Or how about some blue cheese leggings? We also hope that Society6 one day will add tea towels and aprons to their standard products. We really hope you will enjoy our selection. Selection of cheeses in my portfolio. *Society6 is an online print-on-demand shop which offers many different product with printed artworks on them. Which is great as we don’t have to keep everything in stock. The product will be printed and handled just when ordered. Society6 ships anything almost anywhere in the world. It’s getting cold out there so it’s time to cook comforting stews, soups with dark rye bread or have tea with cookies crawled up on the sofa. 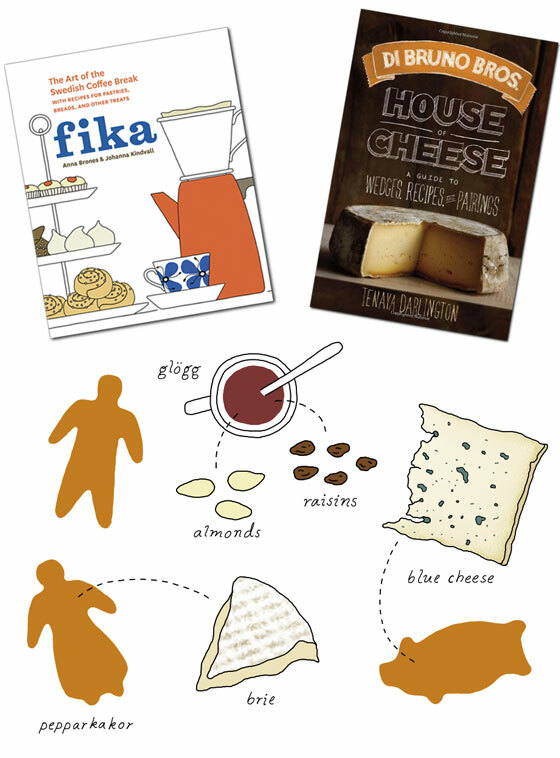 Another combo that works is to host a Fika & Cheese party with glögg. And this is exactly what Tenaya Darlington aka Madame Fromage I did in Philly the other day. I arrived by bus with loaves of rye bread, thin crisps with caraway seeds and ginger cookies while Tenaya unwrapped incredibly luscious cheeses that I had been dreaming of for weeks (and still do). Together we fired up some spicy glögg (image above) just before our guests filled the kitchen/ living room with joyful cheese & baking conversations while we were munching away. One of our guests, cheesemaker Sue Miller from Birchrun Hill Farm came with some of their ‘mind blowing’ blue cheeses. Another guest, Marisa McClellan from Food in Jars brought pickled kohlrabi and honey-sweetened jam that matched our cheese & fika board beautifully. In Sweden we would call this kind of party glöggmingel (mingle with mulled wine), a party that often is held in December prior to Christmas. Want to host a party like this? Then you should continue reading about the party over at Madame Fromage’s blog. Tenaya brings you behind the scenes and reveals how to successfully host a party like this. I especially want to thank Tenaya and Todd for having me in your kitchen. It was wonderful to finally meet you in person. And thanks to everyone who came and made this event into an inspiring and fun party. I hope you all are having a wonderful start of 2015. Winter is here and it’s time for Tenaya Darlington, aka Madame Fromage and my final post in our seasonal cheese calendar, Winter (below you can find links to the other posts). As it is the end of the series, we thought it was suitable to celebrate with a blue cheese pairing party. I hope you have enjoyed our Seasonal Cheese Calendar as much as we have. Eventually we will create cards and prints. They will be for sale in both our shops. Late winter is an ideal time to host an Around the World with Blue Cheese party. In the cold months, who doesn’t dream of traveling abroad? Since so many countries make iconic blues, it’s delightful to take one’s taste buds on a cruise from Stilton to Roquefort, then home again for a taste of artisan American funk. Blues vary widely in taste and texture. Some swing savory with notes of creamed spinach, fresh herbs, or even pine — while others deliver a sweet song to the tongue. 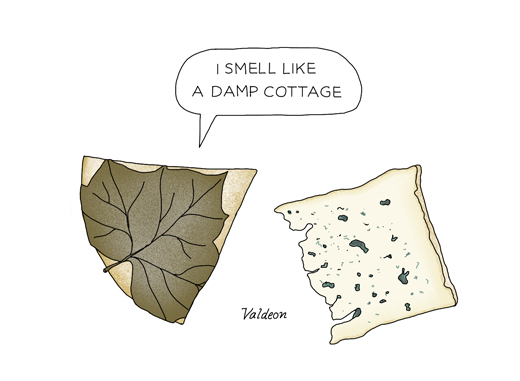 Gorgonzola Dolce tastes like ice cream (try it with cherry jam and graham crackers), and Valdéon can deliver notes of grape and white chocolate. Other blues make me think of oysters – all minerals and brine. Exquisite. 1) pick a wide range of blues, like the ones listed below – aim for five or six hunks, you’ll need ¼ or ½ pound each. 2) Invite 8 to 12 friends, and tell each person to bring an after-dinner drink: stout, barleywine, Scotch/whiskey, or a fortified wine (like Port, Madeira, or Sherry). Then, set out all of your cheeses – let them come to room temperature before serving, and use notecards to label them – and garnish them with some grapes, dates or apricots, walnuts, berry jam, honey, and dark chocolate. At your tasting party, let the blues talk. Try them one at a time with a variety of beverages. You’ll go through every glass in your cupboard. Between bites, you can eat grapes or baguette slices to cleanse your palate. At the end of the night, snap photos of your favorite pairings. If you forget, don’t worry – everyone will remember the night they came to your house for a blue cheese initiation. Note: if you don’t want to mix too many kinds of alcohol, just pick dessert wines or stout/barleywines. Britain’s iconic blue is savory with hints of tobacco and leather. 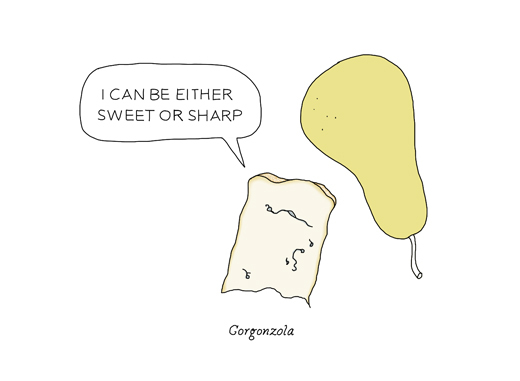 It’s sold in wheels with a cigar-colored rind, making its whole disposition rather grandfatherly. Think of it as a craggy, cozy old character – ideally suited for slushy days and a back-drop of scratchy folk records. “Potted Stilton” is sold in crocks – a sort of holiday treat. It’s soft and pungent, delicious with chutney and a plate of oaty biscuits. 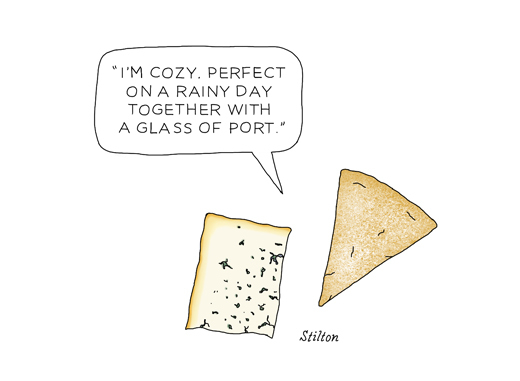 For a much-loved pairing, sip a glass of Port (or even Scotch). Stilton also loves stout. Spain’s most famous blue is a “granny” cheese, sweet and a little salty with a shawl made of Sycamore leaves. Lean in and you’ll smell a damp cottage with a front walkway made of slate and violets sticking up between the cracks. Lovely for dessert, try serving it with a spot of dark chocolate – it has a hint of white chocolate on the finish, which is lovely to play off. Walnuts and honey are a fine pairing, too. Sherry and barleywine make especially good matches. Italy produces a pair of twin blue cheeses, dolce (sweet) and piccante (sharp). Piccante loves pasta and is terrific shmeared on steak or stirred into white bean soup. 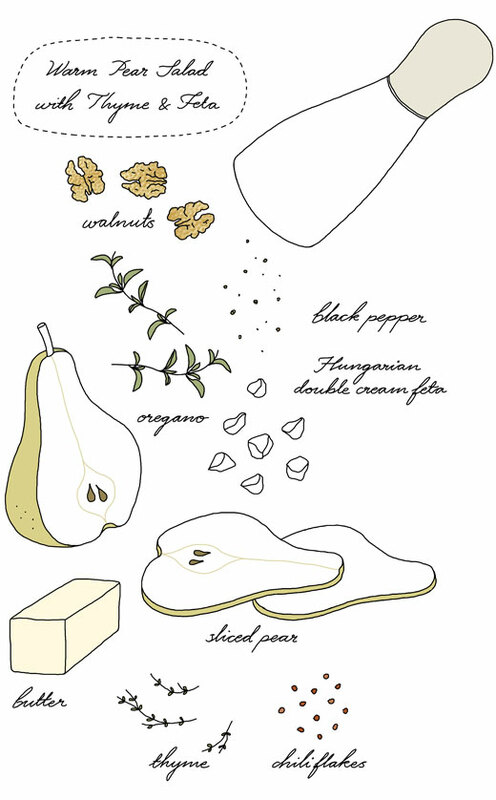 Dolce loves a light clear honey and a crack of black pepper, alongside some pears – it’s so gooey, you can spoon it up like mousse. Try pairing it with a fruity lambic (Kriek) or barleywine. Really good French Roquefort tastes like a cheese from the sea – salty and mineral bright. Its indigo veins shimmer, and its paste is the consistency of melting butter, thanks to sheep’s milk. Roquefort gains its extraordinary combination of flavors from aging in seaside caves that are famous for their “fleurines” – fissures that allow the damp air to circulate. 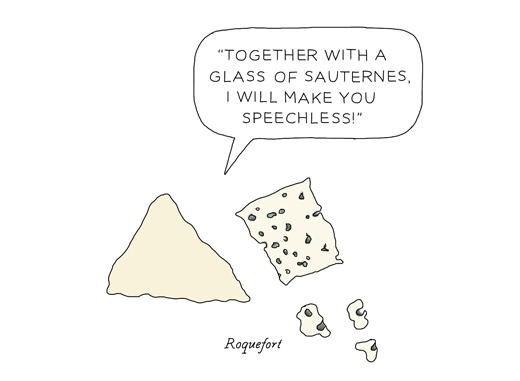 Quality Roquefort (I like Carles), served with a chilled glass of Sauternes, will leave you speechless. One of the great American artisan blues, RRS tastes like bacon in the form of cheese. It loves camping, pancakes, and long walks on the beach. Rogue Creamery, in Oregon, makes a dozen different blues, each one subtly different. 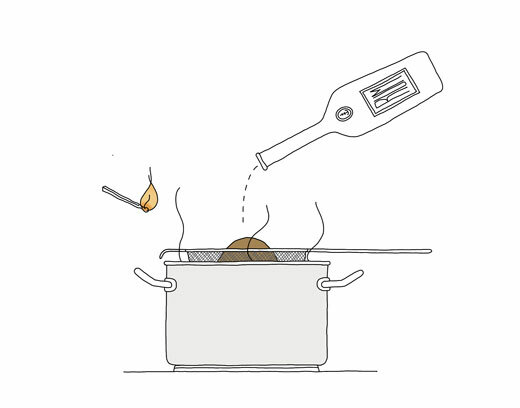 This selection is gently smoked over hazelnut shells, making for a nutty, buttery rogue. Pair it with an achingly dark stout or a Manhattan. 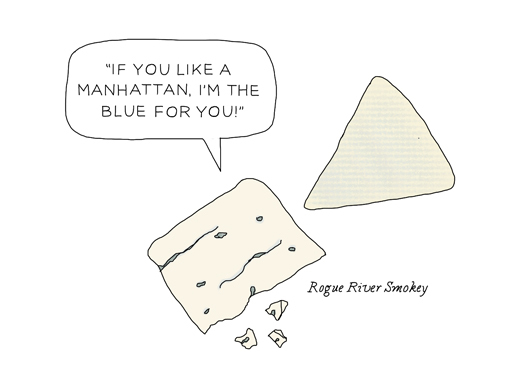 Wondering how blue cheeses get their dark veins? They’re pierced with long needles. The piercings allow air to flow through the wheels, and that promotes “blue-ing.” Many people think that blue mold is injected into the cheese, but that’s not so. The “blue” develops naturally, thanks to a special culture (Penicillium Roqueforti) that cheesemakers stir into the curds. That said, “blue” likes to wander, so you’ll want to store your blue cheeses away from other cheeses in your fridge.